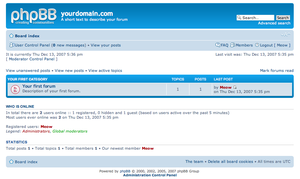 One type of a forum is an online discussion site on the Internet. Users can type messages for others to see, and reply to other user's messages. Messages (or "posts") are organised by topic (or "thread"), with each poster either replying to an existing topic or creating a new topic for a new conversation. Forums can be found on a lot of websites. Internet forums are often used to show people information. Things like pictures hyperlinks and images can also be put on the board, or "posted". Many Internet forums have rules against things such as spamming and trolling. If people do those kind of things, they will be warned, and if they continue, they will be banned. Forums also have their own set of rules. A rule which is used by many forums is not to comment or bring up old threads because those forums were made to discuss the newest events. Member: which nearly everyone is, they can read and create posts. Moderator: someone whose job is to keep order on the forum. They can delete posts and warn or ban members who break the forum rules. Administrator, or admin: The highest rank, who can change settings on the forum and change user permissions. People participating in a forum may make friends with each other and may form groups with the same ideas. This page was last changed on 4 December 2016, at 16:03.